Global Heat Transfer has produced Radiators since 1978 and offers a wide range of Engine Mount, Belt Driven, and Remote (Vertical & Horizontal) Radiators. GHT has been known for their ability to produce more cooling capacity in a smaller & quieter package. Their product range also includes Charge-Air coolers, Liquid-to-Air oil coolers, Lube Oil coolers & After-coolers, in addition to combination units, which include fans. We have Shell-and-Tube heat exchangers, condensers, evaporators, and oil coolers for every application. The company has manufacturing facilities in the US, Canada, and China with service facilities around the US. GHT Radiator cores come in a variety of styles and configurations, which provide high performance, minimal back pressure, and low weight construction for efficiency and economy......We offer a wide range of standard and hybrid configuration which can be configured to meet your most demanding requirements. They offer a wide range of low cost low cost Pre-Engineered packages or custom designed Engine Mount, Belt Driven, and motorized Vertical & Horizontal Remote Radiators. They build and designs completely brand new cooling systems or can provide replacement cores for your existing radiators. They also offer re-core services at their Northeastern service center. A wide range of OEM replacement parts in various applications. 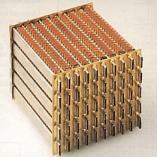 Radiator designs utilize a variety of single or split core, (which is used for 2 circuit cooling). These designs provide the end user with the highest performance, and low weight construction resulting in exceptional efficiency and economy. Whether for Stationary or Mobile application we can design a Radiator to suite your wildest requirements. We specialize in supplying equipment for Generator Sets, Fire Pumps, Water or Sewage Pump Packages, Frack Rigs, or Compressor Packages, used in a variety of markets. If your looking for a radiator to be used in the Commercial, Industrial, Governmental, Oil Platform, Mining, Marine, Military, or Locomotive markets they have the experience to design a Radiator for you. The GHT product range also includes Shell-and-Tube heat exchangers, Plate Coolers, Charge Air Coolers, Gas Coolers, Fuel Coolers, and Oil Coolers. Custom Designs take into account Extreme Temperature, Altitude, Vibration, Space Constraints and other specific variable to meet your needs in stationary or mobile applications. Global Heat Transfer has gained a reputation for rugged reliability. This is achieved through a meticulous regard for quality throughout all stages of design and manufacture. The company operates quality systems and procedures consistent with the requirements of equivalent to ISO9001. Being CRN and ABSA approved gives our customers the safety of knowing that we are providing the highest quality cooling system in the world. We can supply a product to meet your new and more stringent requirements for smaller but more powerful radiators. These increasing demands typical include the need to reduce noise pollution in a reduced foot print, and requiring that whatever the specified thermal ambient, altitude, and environmental conditions, the engine stays cool. Equipment packager and engine manufacturers feel safe in the knowledge that the radiators we supply have been designed by experts who can get the job done quickly and efficiently. Engine Mounted Radiators: Fabricating a complete range of bolted and soldered construction engine mounted radiators, which are designed for industrial applications under world wide operating conditions offers the customer a wide choice. Belt Driven Radiators: A standard range of belt drive radiators. By using aerofoil section fans, maximum blades, and varying fan speed They produce radiators giving, high ambient capability, low acoustic levels, minimal back pressure, and reduced radiator size. Heavy-duty bearings support the fan drive & shaft and, where required, a belt tension mechanism is fitted. Remote (Motor Driven) Radiators: These are available in Vertical or Horizontal configurations and in large engines may involve multiple structures. 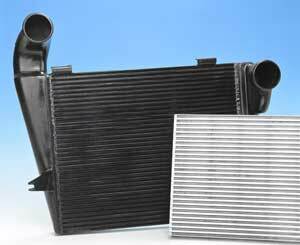 Site conditions may require that a radiator be placed at a distance from the engine to be cooled. A variety of models are manufactured with a wide range vertical and horizontal designs to meet varying physical and noise constraints. Standard foot mounted motors are incorporated into the structure and offer a wide range of direct drive electrical motors or motor driven belt drives as an option. Special voltages, motor starters, mounting structures, protective coatings, insulation classes, and flame-proofing are available on request. The fans are constructed using cast aluminum or reinforced plastic with variable pitch aerofoil section blades to achieve high-pressure head capability and efficiency. Low noise level options are available and can be supplied with silencers for additional noise reduction. The standard electric driven range is typically offered with 200-400 pa of pressure reserve available for external system resistance. Through a careful selection of components which included a combination of high performance cores and fan designs we can offer you a compact and space saving cooling systems with low power consumption, low air volume flow, low package cost, and low noise levels. This line of industrial radiators contribute to the efficiency of the engines cooling and performance through a combination of superior design, reliable construction, and built in design efficiencies. Their uniquely diverse product line offers core face areas from 6 square feet to 68 square feet, which can be adapted for stationary or mobile applications of fabricated aluminum plate & bar, bolted, or tubular construction. A variety of electric motor driven or belt driven fans, as well as vertical or horizontal configurations. Custom and unique applications are their specialty. Our Aluminum Coolers are capable of pressures of up to 450 PSI and 400F. Burst tests on GHT Aluminum Cores have gone over 1400 PSI! A wide range of low cost Pre-Engineered or custom designed Air to Air and motorized Oil Coolers and After Coolers plus Plate Coolers are available. Class 8 Truck Charge Air Coolers to replace OEM CAC's. 4 different Internal Fin choices and 5 different External Fin choices for your custom design needs. Plate Coolers: A wide range of OEM coolers including products to replace CAT, Cummins, MTU-Detroit Diesel, Komatsu, John Deere, and others. GHT also has available a wide range of Cat. & Detroit Diesel Oil Cooler & Radiator Gasket replacement parts. They also offer OEM replacements for most Compressor packages which include: Oil Coolers in addition to Air to Air /Air to Oil Combo Coolers. We can offer a complete system that is in one unit, all cooled by a Single Fan! GHT is an acknowledge and respect supplier to the world generating set market and a significant supplier of radiators for the oil patch machinery, pumping and construction equipment, on and off highway, rail traction and other specialist equipment. Their emphasis on innovation and extensive experience and technical knowledge has made them a market leader. Marine Radiators in all core types are available with all metalic parts including the guards and structural members completely coated with Heresite which is a baked phenolic protective coating......It will offer additional protection against damaging environment such as salt air, acid rain, and swimming pools chlorines (chlorine < 100 ppm) as well as most other corrosive atmospheres......Other available coatings include E-coat an immersion coating process or hot dipped galvanized.